Music enriches the daily round of worship for every Cathedral in this country, including here at Exeter Cathedral. At Evensong each day, weekly at the Sunday morning Choral Eucharist, and at countless other special occasions throughout the year, the Cathedral Choir and music team continue to play their part in an ancient tradition that dates back for hundreds of years. Without financial support from the Music Foundation Trust there would be no music at Exeter Cathedral. Maintenance of the historic Cathedral Organs. Choral outreach work in Devon and further afield. 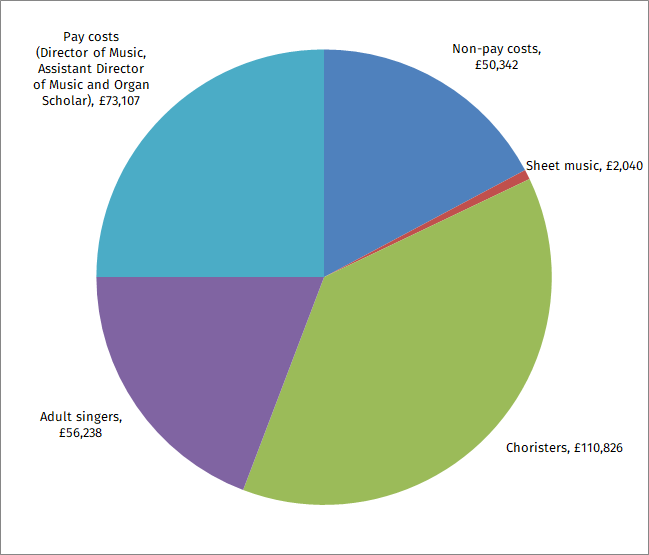 The annual cost of providing these music services in 2016 was £292,553. The Trust donated £125,000 to the Cathedral, and increased this amount to £145,000 in 2017. Contribute to the cost of commissioning new music for the Cathedral Choir. Consider leaving a legacy or making a donation. Exeter Cathedral can now accept donations online to support the musical tradition that dates back over many centuries. Monies donated to the Dean and Chapter ‘for music’ (including using the button below) will be passed into the stewardship of Exeter Cathedral Music Foundation Trust. Please juliet@venbridge.plus.com for more information about supporting the work of the Exeter Cathedral Music Foundation Trust through legacies or other gifts. Use these pages to find out more about the musical tradition at Exeter Cathedral.